What I meant is if that website tracks all "Battlefield" players rather than solely its users. Does that website actually track all those stats automatically? I think so. 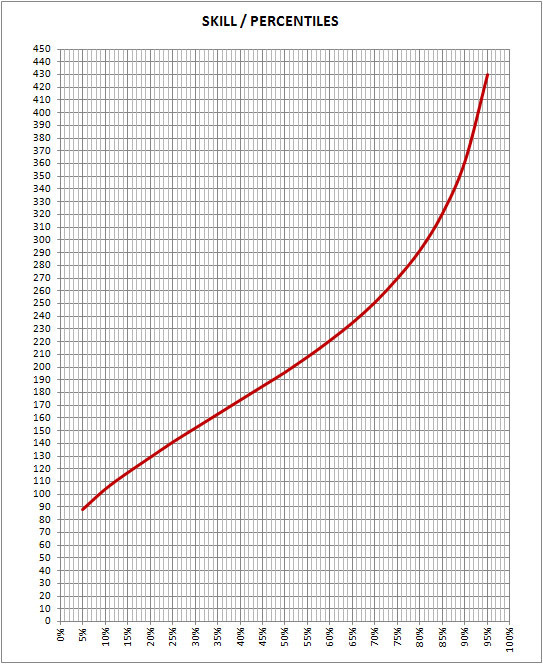 The graph was made with the stats of 337,100 players. That does not sound like a lot when compared to the actual player population that number in the millions. For example, "Battlefield 3" sold more than 15 million copies in total and "Battlefield 4" sold more than 7 million copies in total. I have a feeling that those stats only compose of players dedicated enough to "Battlefield" games who use that website for tracking their performance, which means that it does not accurately represent the true player base. if i'm not wrong it actually updates information of only the names who have ever been input in it at least once,though that obviously doesn't need to be done by the actual users, iirc, sometimes people gets added automatically, but i may just be wrong. 300k people it's still a lot though. That just makes the data be collected from a group of players more dedicated to "Battlefield" games. They potentially play much better than the general population. That's bit of a problem when you use BF#Stats indeed. You can query player stats for free but you need to request an API key and stuff to be able to update player stats upon query. I also had this problem back when I did this stuff, and also had bit of problem getting other than most recent players. Where did you fetch playernames for your stats btw? I would be interested to know if I missed some neat trick / page that happens to list all playernames in random order or so. That's bit of a problem when you use BF#Stats indeed. You can query player stats for free but you need to request an API key and stuff to be able to update player stats upon query. I also had this problem back when I did this stuff, and also had bit of problem getting other than most recent players. @leptis Where did you fetch playernames for your stats btw? I would be interested to know if I missed some neat trick / page that happens to list all playernames in random order or so. Just request a key. I did. Reason for key. " curious maybe I'll do something with it eventually"
BF4stats provides rankings per parameter (leaderboards). That is ordered by value. 337,000 players seems a sufficient sample. I tried to extract the data by scraping, but since I am very bad for those things and I did not have the patience, in the end I did it with an expedient method. I divided the total players listed by 20. And I registered order number (16,850th, 33,700th etc ...) and K / D. It is easy (a little boring) because as the number of players per page is fixed, it is known on which page the requested values are. In total twenty pairs of values. You get an Order vs. K / d curve (it is S-shape type, cumulative frequency). Turning it into a K / D vs. Frequency curve is just a trivial numerical question. In fact you are extracting 5%, 10%, 15%, etc percentiles. The technique is good because it automatically filters out strange values (K / D = 1000 or so) but is not good for extreme value analysis , that in this case are really weird. Now I know an easier way to do that with Googlesheet because it has a formula ("ImportHTTP" or something like that) that can extract specified pages. 10 or 20 extractions. BF4STATS/Leaderboards. SKILL. Sample = 193,831 players. Class = 9,691 (5%). 20 classes. Syntax = = ImportHTML ( "http://bf4stats.com/leaderboards/pc_player_skill?start=9.690"; "table"; 1). One less than "class" and the value is the first in the table. Less than 5% and more than 95% unreliable values. Time to extract 7 minutes. Time to make a fancy graph and upload to IGMUR... etc... 10 minutes. For anyone who wants to have fun with the data ... or know their percentile. Welp... I have done all this manually with all kinds of dirty (and superduper messy) Python codes, and meanwhile there exists functions like that. And even with all that code I only gathered sample of 40k players, albeit I gathered almost all variables there is just in I case I need them one day.